Nocturnal leg cramps are a pretty common problem for millions of people around the world. The term describes involuntary contractions of the feet, thigh and calf muscles that can be quite painful. Nocturnal leg cramps occur overnight and usually last from a few seconds to a few minutes. Some people think that nocturnal leg cramps and restless leg syndrome are one and the same, but both conditions greatly differ. RLS does allow you to move your legs in order to reduce the pain, while the cramps impair the normal movement of your legs. They are also much more painful, and can even make your muscles sore in the morning. 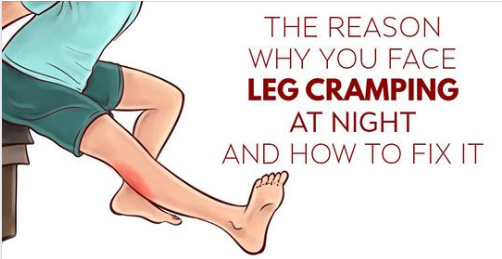 Science is still searching for the elusive cause of nocturnal leg cramps, and according to experts, there’s more than one problems that may cause them. Nocturnal leg cramps have been associated with magnesium, iodine, calcium and potassium deficiency, as well as pregnancy and dehydration. Other causes might be thyroid disorders, poor circulation, muscle overload, constant use of some drugs and prolonged exposure to low temperatures. Regular exercise and staying physically active are key for prevention of nocturnal leg cramps. Avoid long periods of standing or sitting and move more in order to relax your muscles and prevent the cramps. If you wake up overnight with a painful cramp in your legs, try stretching the painful muscle to relieve the pain. Drinking plenty of water every day will hydrate your muscles and body and prevent the occurrence of nocturnal leg cramps. Acupuncture will relax your muscles and treat the root of the problem, as can regular calf massages. Magnesium deficiency is one of the main culprits for nocturnal leg cramps, so make sure to keep your magnesium intake at an optimal level at all times. This mineral is vital for numerous muscle functions, which is why you need to consume magnesium-rich foods more frequently. You can find the mineral in nuts and seeds, avocados, dry fruit and bananas. Additionally, you can also prevent the cramps by rubbing a homemade magnesium oil on your leg muscles. Boil ½ a cup of filtered water in a pot and add ½ a cup of magnesium chloride flakes, then leave the oil to cool down before pouring it into a spray bottle. Spray a bit of the oil on your calves before going to bed and give the muscles a massage to reduce the risk of nocturnal leg cramps. Epsom salt baths are a great way of optimizing your magnesium levels and preventing nocturnal leg cramps. The bath will also relax your muscles and provide additional protection from the painful event. If you get a cramp in the middle of the night, try moving the leg in order to boost the circulation. Rub the muscle to relax it or sit on the floor and extend your legs, then flex your feet at the ankles. To reduce the risk of nocturnal leg cramps, you should make sure your bedsheets and covers are loose, as tight ones might squeeze your leg muscles and impair your circulation which will result in the cramps.